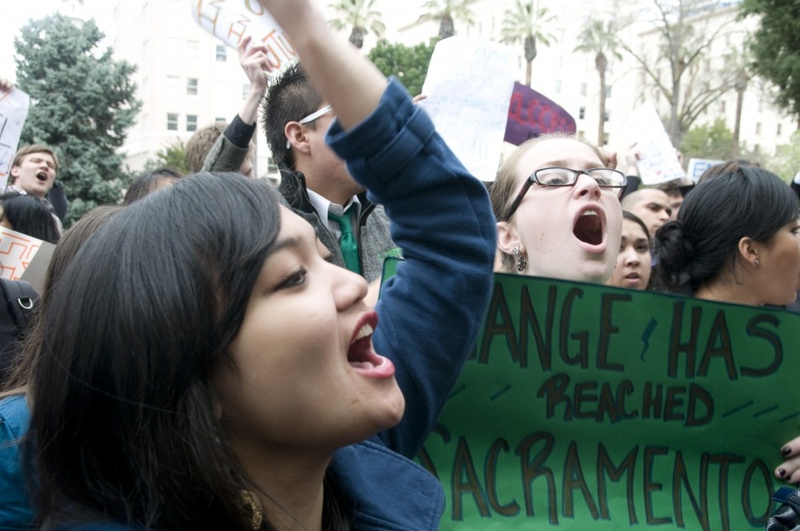 Hundreds of students rallied on the north steps of the Capitol building in Sacramento on Monday. Chanting could be heard for blocks. Photo by Alex Zamora. 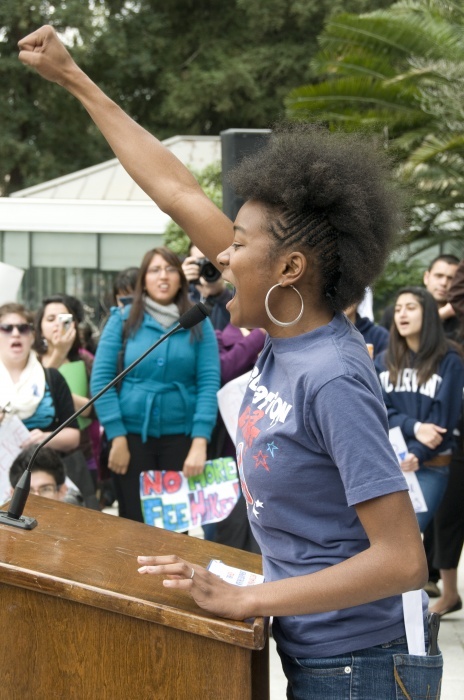 Third-year Tiffany Loftin, internal vice chair of the UCSC Student Union Assembly, was one of many speakers who commanded the attention of the large crowd of students gathered in solidarity at the Capitol building. Photo by Alex Zamora. The March for Higher Education on Thursday is a “K through Ph.D.” action that will include University of California students as well as all members of the California education system. UC President Mark Yudof and UC Santa Cruz Chancellor George Blumenthal accompanied student lobbyists to meetings with members of the legislature throughout the day. 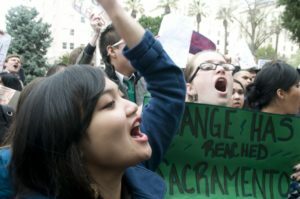 Though Monday’s activities were focused on lobbying, student demonstrators rallied both inside and outside the Capitol. One demonstration, a sit-in at the office of Assemblyman Jim Neilson (R-Yuba City), resulted in the arrest of five UC students. Second-year Gabi Kirk, one of three UCSC students among the five UC students arrested, described the scene as nonaggressive. The five students were arrested for assembling without a permit, and were charged with an extra misdemeanor for disrupting state business, according to Kirk. Because the state Capitol is under the jurisdiction of the California Highway Patrol (CHP), the students arrested were taken by van to CHP headquarters, where they were cited and released. 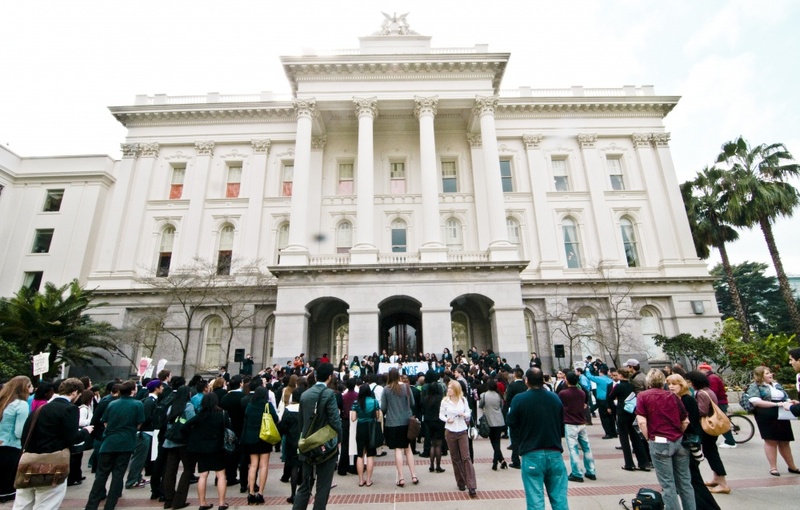 The demonstration inside began when several students — independent of any organization — gathered outside the offices of Senate President Pro Tem Darrell Steinberg and Assemblyman Nielsen, intending to present them with a letter containing two demands. Steinberg met with a group of students and arranged for a follow-up to discuss their concerns on March 25. Nielsen, however, declined to speak to students. 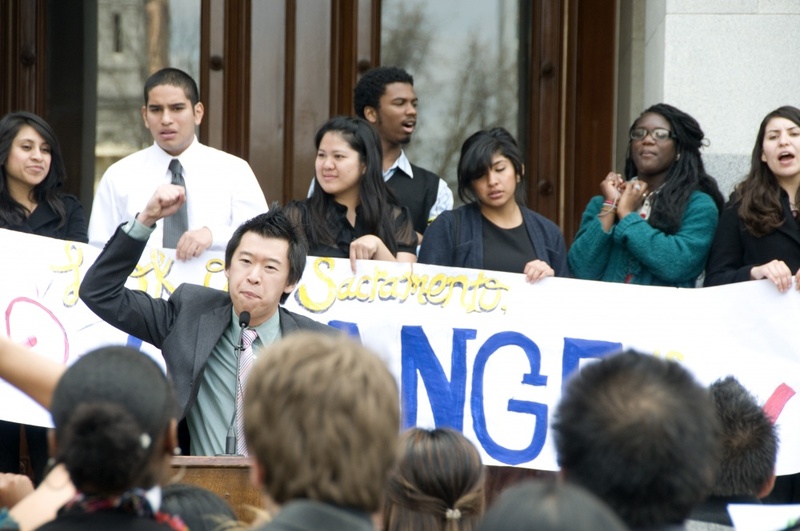 The sit-in began when 11 students refused to leave Nielson’s office until they were allowed to meet with the assemblyman. After asking them to vacate the office, CHP officers zip-tied the wrists of the five individuals who had decided to stay and escorted them to CHP headquarters. “These actions were taken by individuals to take it to the next level and push the envelope of prioritizing higher education,” UCSC first-year Natan Tietz said. Tietz was among the group of about 100 students gathered outside the offices in support of the sit-in. Present at the protest for a short period of time was Dolores Huerta. Huerta is considered by many to be a significant figure in the history of grassroots activism, due in part to her role as co-founder of the National Farm Workers Association with fellow civil rights activist Cesar Chávez. A building at Oakes College is named in her honor. In the hours preceding the sit-in, students and members of the legislature spoke to the crowd of hundreds of supporters on the north steps of the Capitol. Many students spoke to the importance of rallying for public education. “From all across the state, we’ve come together to say that education is a right and not a privilege,” said Victor Sanchez, UCSC’s Student Union Assembly (SUA) external vice chair. Sanchez also serves as president of the University of California Student Association (UCSA), whose members organized the day’s events. On the north steps, over the noise of another speaker, Democratic Assemblyman Warren Furutani explained his reasons for supporting the student mobilization. Furutani went on to discuss the significance of bringing the struggle to the Capitol.